The biggest club of Southern Ukraine, Chornomorets (in Ukrainian), or Chernomorets (in Russian, which is the dominant language in the region), were a well-respected name in former USSR times, while after independence they have established themselves as one of Ukraine's top teams, despite their significant ups and downs. The home stadium of Chernomorets. Odessites (the people from Odessa) are famous in Ukraine (and what used to be the Soviet Union) for their... particular sense of humour. Funnily enough, “1958” and “1959” have occasionally appeared on the team's logo, even though 1936 is officially accepted as the founding year of the club (as Dynamo Odessa), while, according to their official website, traces of today's Chernomorets can be found as far back as 1878. Everything has its explanation; 1958 was the year the club was first given the name Chernomorets (Chyornoye More is Russian for “Black Sea”). As for the distant 1878, it does make sense if someone takes into consideration the fact that Odessa is a major port city on the Black Sea, and as exactly is the case in many other countries, football was first introduced to their biggest port cities, where interaction between locals and foreigners coming from countries were football was already played (namely England) was very common. In Soviet times, Chernomorets were a competitive team, even though they didn't manage to win any major trophy. Third was the best they finished in the Championship in 1974, while in 1966 was the first and last time they made it to the semifinals of the Soviet Cup. Just before the dissolution of the Soviet Union, Chernomorets beat Dnipro in the Final of the then-recently established Federation's Cup (League Cup), a title not as big as the Championship, but one that signaled that good times were coming for the club. By 1992, Ukraine was an independent country with its own national Championship, and, Chernomorets crowned as the first Cup winners. Next season, led by the league's top scorer, Serhiy Husyev, the team finished third, something they repeated a year later, combining their good Championship run with a second triumph in a Cup Final, led this time by newly-arrived Tymerlan Huseynov, who scored a total of 20 goals in 41 matches in both competitions. Chernomorets gave their all to win the Championship the next two seasons, but Dynamo Kyiv were just too good to beat. The Odessa team finished second both times, before plunging into financial trouble, that saw them getting relegated three times in 13 years. Chernomorets Stadium, after its reconstruction and reopening in 2011. In 2011, the team got into their totally revamped stadium, a true football jewel for Odessa. 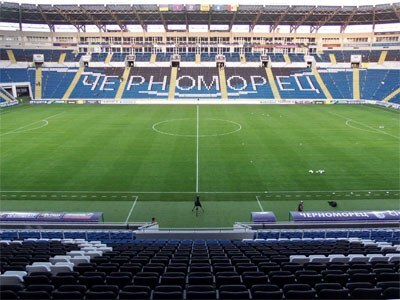 Two years later, Chernomorets had their best season ever in a UEFA competition, starting their Europa League adventure in the second qualifying round, knocking out three opponents to make it to the group stage. There, huge wins over PSV Eindhoven and Dinamo Zagreb helped them qualify to the last 32, where they were eliminated by Lyon after a 0-0 draw at home, and a narrow 1-0 defeat in France. A ball has been central in the club's emblem almost since its founding. The seagull (a rather common bird in coastal Odessa) is a nineties' addition, symbolizing pride. “Chernomorets” is the team's name in Russian, the number one language in Southern Ukraine, and 1936 is the club's officially accepted founding year.